With regards to a diamonds clarity, all stones contain inclusions. Only, sometimes they are so small or minute that even with a 30X magnification it is rather difficult to identify. The stone might include imperfections, but especially with color diamonds, sometimes, the appearance of imperfections is almost hidden. For example, the diamond in the image below has some inclusions that are so small and blend in well with the color, that even with significant magnification, the appearance of the diamond is still exquisite. Diamond Clarity In Fancy Color Diamonds. How the imperfections affect the value of the diamonds depends entirely on what type and what size the inclusions are, and also where in the stone the inclusions appear. It is possible for a diamond to receive a low clarity grade as a result of the imperfections in the stone and therefore have a reduced cost, but still remain 'eye-clean.' Thus, a great deal for the educated buyer! There are many different types of inclusions that can be found within a stone. Both the internal and external imperfections in a diamond can affect the appearance, but depending on the color of the stone and the color of the imperfection, it may not be so noticeable. Black spots, in the stone, in general, are the type of inclusions that are most frowned upon. Black spots are areas that never crystallized and are therefore quite noticeable. 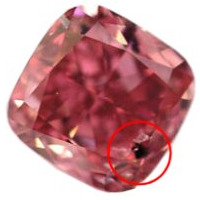 0.54 Carat, Fancy Deep Pink, Cushion, SI2, With Black spots (Black Crystals). White spots, otherwise known as "icy inclusions", also have a significant negative effect. These inclusions can cause a milky, opaque, or a cloudy area in the stone. A white inclusion can affect the overall visual clarity of the diamond. Left: 0.51, Fancy Intense Blue with white feather on the table. Right: 0.61, Fancy Vivid Purplish-Pink, Princess, I1 With White feather and White Crystals Inclusions throughout the diamond. The affect of the inclusions on the appearance of the stone depends entirely on what type, what color (of both the inclusion and the diamond), and the location of imperfections identified in the diamond. Inclusions that appear along the girdle or in the pavilion of the stone are in higher demand than those that are located in the table of the diamond. An inclusions found in the table of the stone is most often more noticeable than those that may appear within the facets of the stone. Also, once placed in a piece of jewellery, imperfections along the girdle or in the pavilion may not be as noticeable and be somewhat hidden by the setting in which the diamond sits. When considering adding a stone to your collection, the 4Cs (Carat, Clarity, Color, and Cut) are the main factors that should be concentrated on when assessing the stones. Carat we know refers to the weight of the diamond. Color is actually derived from the purity of various compound elements. Cut describes the art and style of how the gemologist cut the stone. But what really is the definition of Clarity? The actual definition of what diamond clarity is, basically describes the diamond's overall appearance in relation to the number of both internal and external imperfections in the stone. Each stone is assessed and then graded according to a standardized grading scale. Diamond clarity is broken down to six categories, of which many contain a number of clarity grades. As the clarity grades move along the scale to a lower clarity grade, the overall value of the diamond decreases. Still, even though the clarity grade may drop, it might not necessarily affect the unmagnified appearance of the stone. In a colorless diamond, clarity is a very important measurement to scale. However, diamond clarity does not play as much of an important role in fancy colored diamonds as it does in colorless stones. When purchasing a fancy colored diamond, the color and intensity are far more important than the clarity of the diamond itself. Diamonds are the strongest element known to man today. Still, they are mined after having traveled to accessible depths through volcanic eruptions, and having been created in unimaginable conditions deep below the surface of the earth. Therefore, it is needless to say that various imperfections within the stones can occur. The inclusions that are found are broken down to two categories, 'Internal' inclusions and 'External' inclusions. All diamonds have inclusions, only depending on the type, the size, and where in the stones they are located they might not necessarily affect the appearance of the stone. Left: 0.35ct Fancy Purplish Red Heart (External Inclusion). Right: 2.28ct Fancy Orangy Brown Round SI2 (Internal Inclusion). 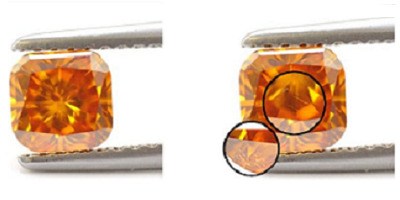 The inclusions found in the stones are noted in the GIA certificate, with both text and images that specify where the imperfections are found. Diamond Inclusions Noted On The GIA Certificate. A stone with an SI2 inclusion grade can sometimes appear 'eye clean' even though its monetary value is significantly lowered. That means it might cost a lot less for the stone even though the diamond is still bursting with life. There is so much more than just the clarity grade that can affect the appearance or the value of the stone and it is therefore extremely important to inspect each and every stone you consider purchasing. Throughout the years, several professionals have perfected their ability to naturally improve the clarity of their diamonds. One, who knows exactly what he is doing, can actually polish away an external blemish. However, much care must be taken when changes like this are made, since the size, the weight, and sometimes even the shape of the stone can be changed. Also, putting a stone back on the polishing wheel is always a risk. There are firms that specifically look to purchase stones that look like it can be naturally modified, and with their outstanding polishing skills, they can improve the overall clarity of the stones. 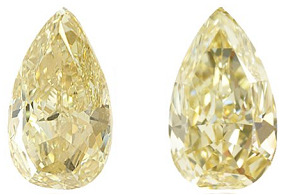 Below are images of a Fancy Yellow, Pear-shaped diamond that was modified. The stone was originally an 11.24ct, Fancy Yellow Diamond with an SI2 clarity grade. The stone was corrected to a 10.79ct, Fancy Yellow Diamond with an IF clarity grade. Left: 11.24ct, Fancy Yellow, SI2. Right: 10.79ct, Fancy Yellow, IF. There are also various forms of artificial enhancements one can do on a stone in order to enhance its clarity or color such as "Laser Drilling" (Keduach Meyuchad) and "Fracture Filling." Any artificial enhancements are of course legitimate, only it absolutely must be made aware to the ones purchasing the stones beforehand. It is important to remember that in reference to diamonds, 'perfection' is a relative term. With sufficient magnification, inclusions will be revealed in almost any diamond found. Needless to say, each diamond still needs to be assessed by a professional as not to accidentally overlook any detrimental imperfections.